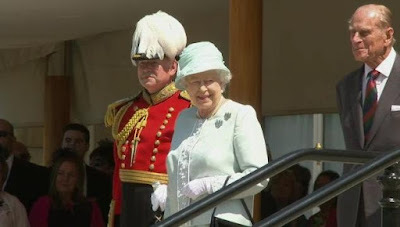 The Queen, accompanied by The Duke of Edinburgh, reviewed The Queen's Body Guard of the Yeomen of the Guard in the garden at Buckingham Palace. Her Majesty then hosted a reception. For more: ITNSource video, Zimbio gallery. Hmm. This hat reminds me of the hat she wore to the recent garden party in Germany, almost a cloche style. And...no thank you. The Aqua Clips on the other hand...yes please.